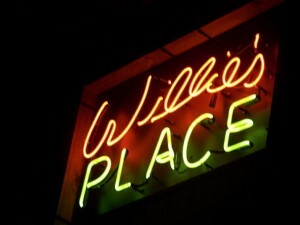 Willie’s Place Theater, at Carl’s Corner, Texas closed in 2011, but will always be one of fan’s favorites place to see Willie Nelson & Family perform. 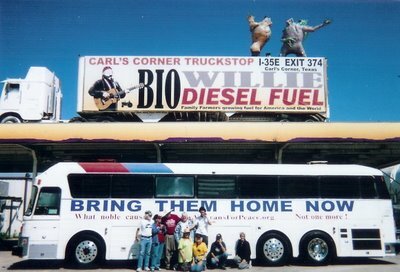 When the Carl’s Corner truck stop changed hands, the Willie Nelson Theater and Willie Nelson themed truck stop were closed. It was in operation for about three years, I think, it’s most recent version, anyway. 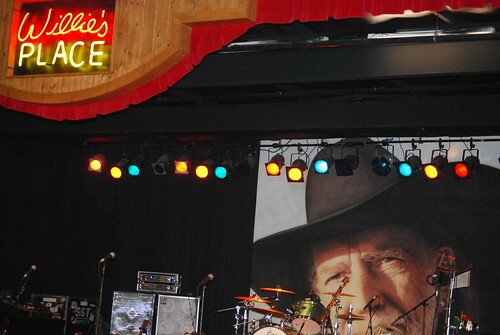 Truckers, tourists, and Willie Nelson fans loved it. 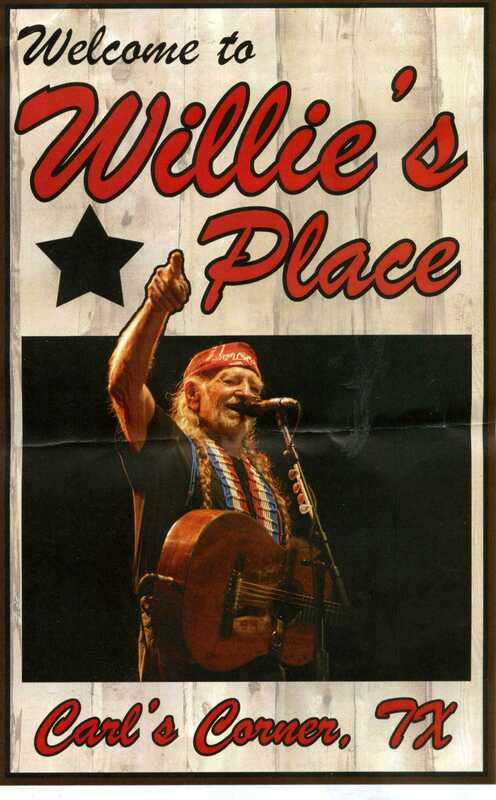 But the real joy about the place was Willie’s Place theater, and getting to see Willie Nelson and Family perform there. 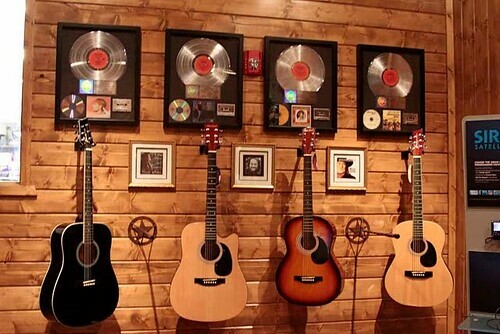 It was the greatest place; it had great sound, it was cozy. There wasn’t a bad seat in the house. 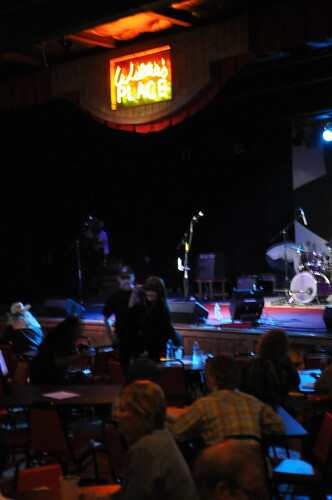 We sat at small tables set pushed up close to the stage, but you could stand at the bar and still make eye contact with Willie. 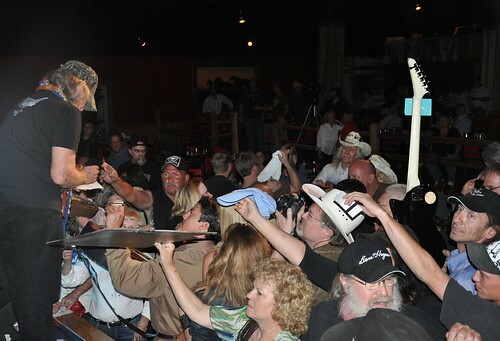 It was a low stage, and Willie generously spent time after every show talking with fans, signing autographs, hugging people, posing for photos. Here’s Janis from Texas, hard at work hanging pictures at Carl’s Corner, Texas. 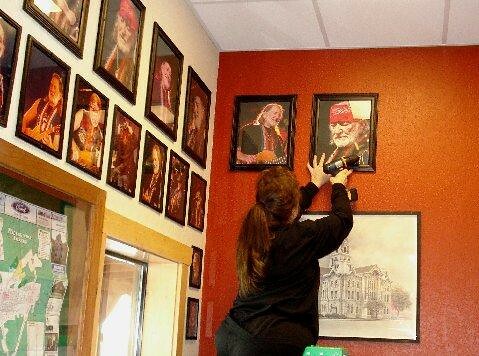 Janis personally framed thousands of pictures of Willie Nelson and Family and Friends and Fans, and hung them on the walls at Willie’s Place Theater. 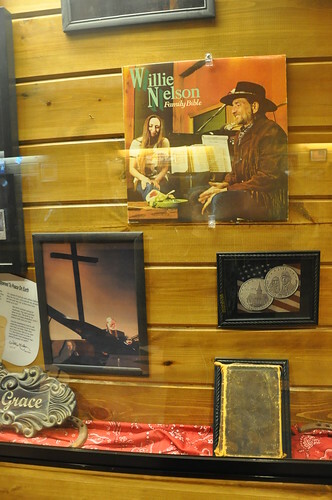 The photos were sold off the walls when the Truck Stop closed. The place was a destination; when Willie did a show there we would all get there as early as we could so we could hang out with friends, eat at the Blue Skies Cafe, wander around and enjoy all the pictures on the wall, and display cases full of memorabilia. 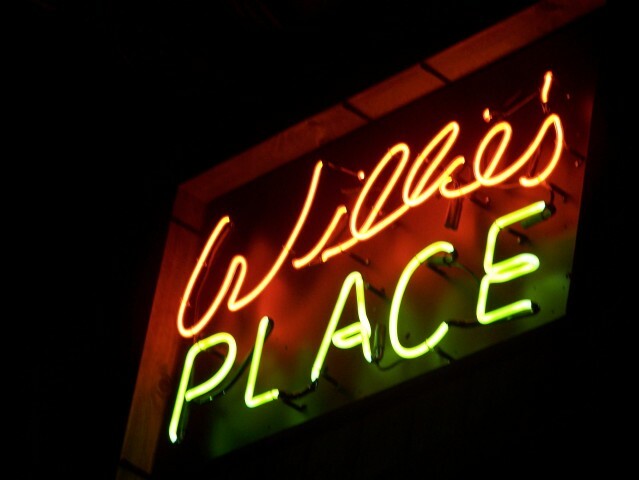 Janis Tillerson spent the three years Willie’s Place was open gathering pictures from fans, framing them, and hanging them on the wall. 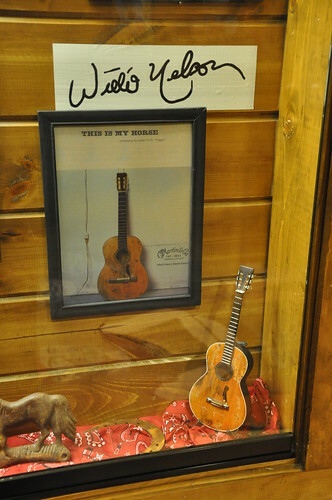 She filled display cases with collections like the Tee-Shirt from the First Farm aid, albums, a miniature Trigger guitar, photos of fans with Willie. 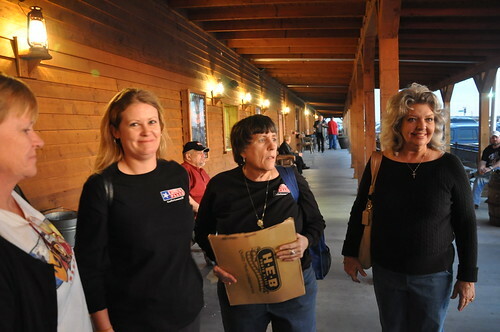 Willie Nelson fans at Carl’s Corner, Texas, gather before the show. 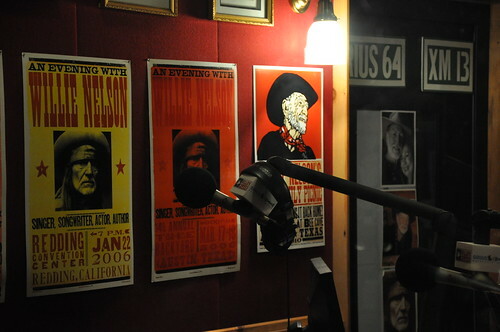 Willie’s Place, on Sirius/XM Radio, broadcast from it’s studio in the Willie Nelson theater, and if they were on the air you could watch Dallas do his show. 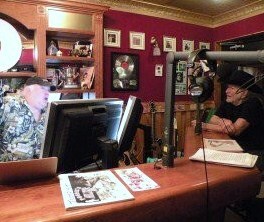 A few times, fans got to watch Willie being interviewed by Dallas Wayne or Bill Mack. New owners will take control on February 1st, next week. 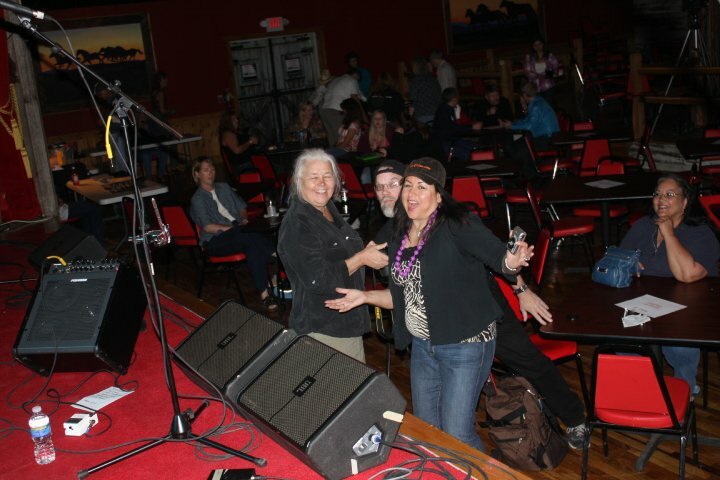 Thanks to Jan, from Texas (RailRoadLady) for sharing this pic. 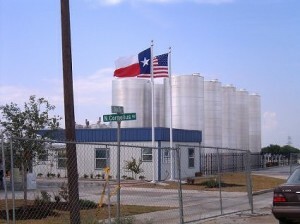 The news articles report that Willie Nelson biodiesel plant, located beside the truck stock, is not effected by the foreclosure actions, and will remain in his control, with other partners. So I’ve been mourning the loss of the theater, but now I just have to smile about the good times we had there and all the great music we heard. It was one of those moments in time, great memories for those of us lucky to have been there. So, goodbye; we’re gonna miss you. Monique from The Hague, visited Texas with husband Mark, and took this pic. Property, business opportunies offered at Carl’s Corners. Development proceeds at a rapid pace at the Carl’s Corners project just north of Hillsboro. Carl’s Corners promises to be a gigantic show place consisting of a mammoth truck stop with a huge multipurpose center with many auxiliary businesses. Located along I-35E FM2959, Carl’s Corner is being developed by Carl Cornelius of Hillsboro and several other Dallas investors — one of whom is Monk White. 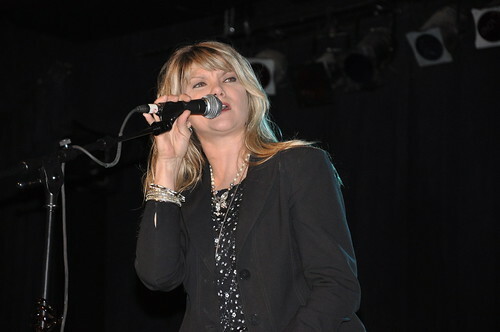 American Country will be bringing details about Carl’s Corners and its personnel in the months to come. No date for initial opening of the first phase of this development has been announced. 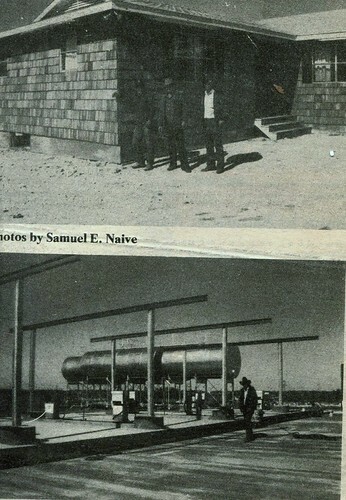 The Restaurant, dining building at Carl’s Corner are complete, according to Carl Cornelius, (pictured in the top photo, with Darrril Wright and LeVan Gordon). Cornelius went on to say that carpenter and carpenter helpers are needed for other projects. And, Cornelius siad applications are now being taken for the operation of restaurant, multipurpose center, and truck stop. 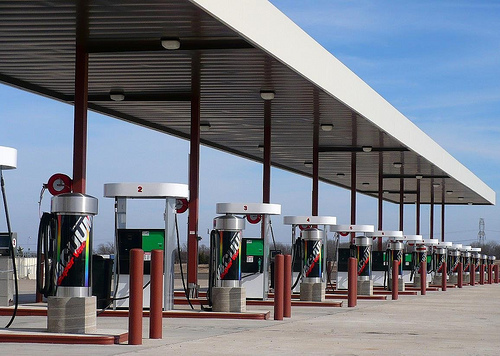 Carl’s Corners truck stop (in bottom photo), located at one of the most visible sites in Texas, promises to become a number one stop along I-35E — referred to Mainstreet, Texas. This truck stop will reputedly rival the internationally famous truck stop in Cheyenne, Wyoming because of the many facilities offered. 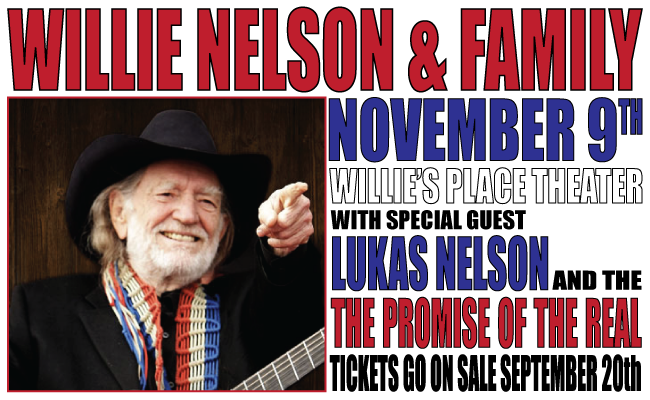 Tickets are on sale now for the Willie Nelson & Family show, with Lukas Nelson & the promise of the Real on November 9, 2010. 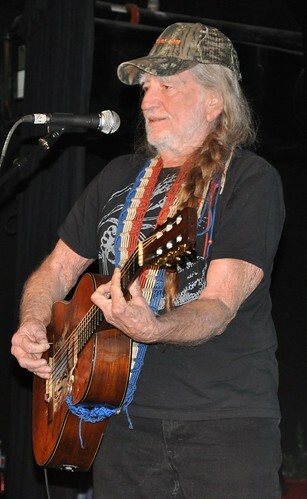 Willie Nelson’s Fan Club, Club Luck announced today that Willie Nelson will perform at Willie’s Place Theater on November 9, 2010. The fan club will be offering a pre-sale to their fan club members starting on Wedneday, September 15th, at 10:00 a.m. Texas time. 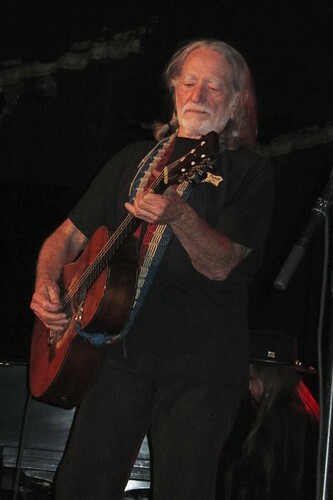 Willie Nelson announced on the Bill Mack show today that he would be performing at Willie’s Place Theater on November 9th, 2010, along with Lukas Nelson and the Promise of the Real. 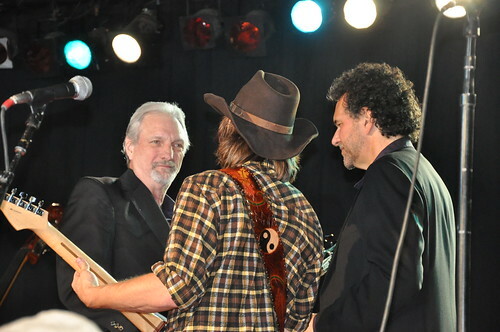 Also, Willie announced that he and Lukas would appear at Center Texas on November 8th, 2010, for the Rotary Club. 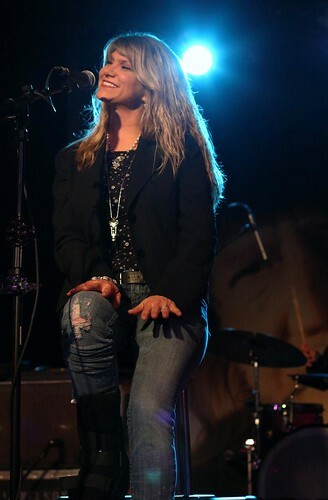 Thanks to Rick for sending me this picture he took of Paula last weekend, at Willie’s Theater, Carl’s Corner, Texas. 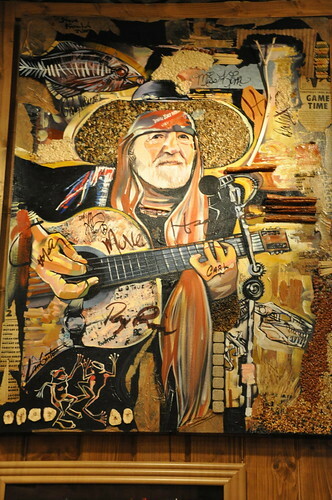 Willie Nelson and his fans, Carl’s Corner, Texas. 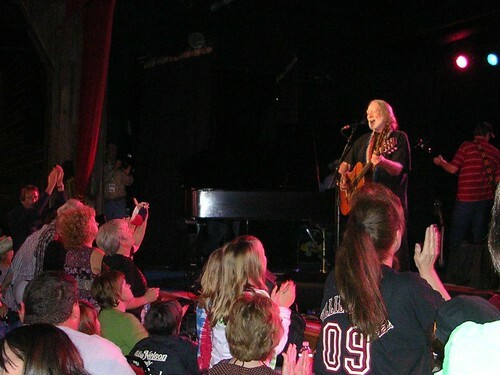 After Willie sang, ‘Have you Ever Seen the Rain’ with daughter Paula, he stayed and sang several more songs, then spent about an hour hanging out with fans. 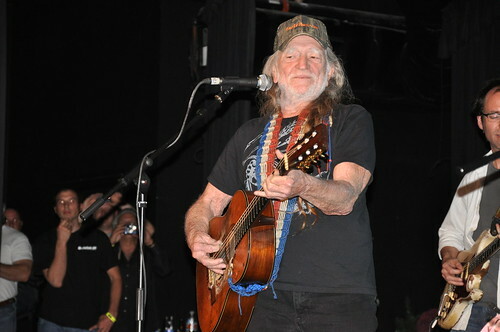 I sneaked up and took some pictures of Willie and his fans from the wings, and it is really something to see, the way Willie Nelson interacts with his fans. 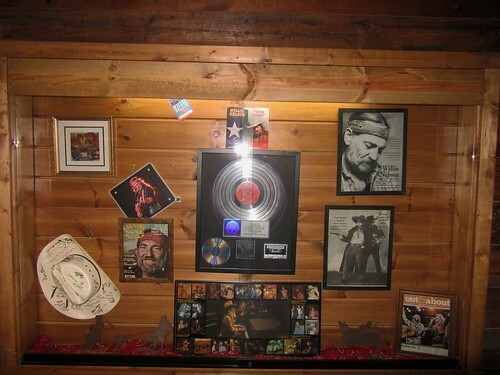 This is one of the many original works of art on display at Willie’s Place, Carl’s Corner, Texas. It’s always fun to get to see a show in Texas; I get to hang out with some great friends. 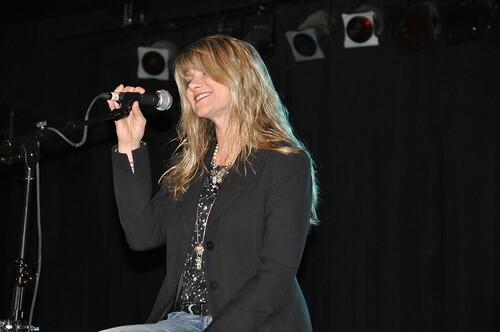 Here’s a few crazy people who like Paula Nelson and Willie Nelson & Family as much as I do. 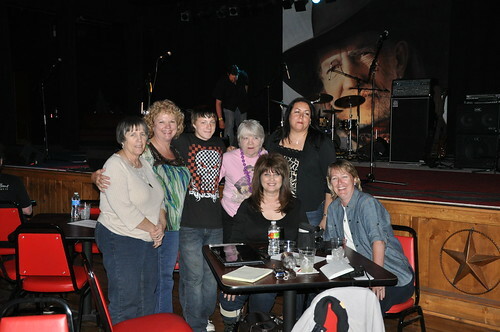 These are alias, of course, but left to right: Anne, Pat/Miss Tex, Anthony, Jan/Railroad Lady, Janis from Texas, Esther from San Antonio, and Kelly from Austin. That’s me, Rick, Esther and Lily.